On Namit: black shirt, from DC, Mumbai. On Shruti: white crop top, from Bhaavna Bhatnagar; striped palazzos, from Chola. Both in Mumbai. Earrings, rings, Shruti's own. 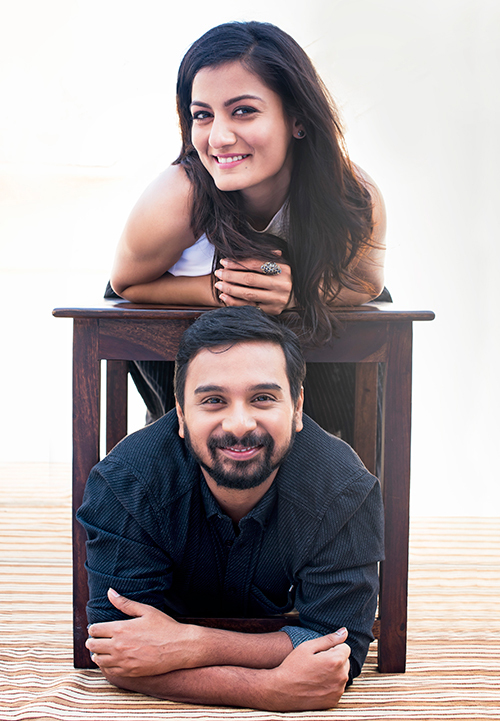 From an initial phase of hesitance to the quiet confidence they now enjoy, the couple has cemented its place in Mumbai’s theatre circuit. It’s also not uncommon to see either of them on television — Das gained recognition post a Vodafone commercial. Vyas was the face of the OLX Womaniya campaign. Even though both have enjoyed the glamour of films, especially Das with Wake Up Sid (2009), they keep going back to the stage. Vyas is part of Cinematograph’s new offering I Don’t Like It As You Like It, that carries on the tradition of combining Shakespeare’s words with mime and clowning. Meanwhile Das is all set to perform in Mira Nair’s Broadway rendition of Monsoon Wedding (2001), essaying the character of P.K. Dubey, the tent contractor. When it comes to their profession, they are pragmatic, but their personal life is a different story. Their relationship saw a turbulent start. “Ten days into it, I thought we were getting into a serious phase, and I backed out,” reveals Das. “This after saying that he sees us getting married and having children,” quips Vyas. “She said there was no point to this and walked out. I couldn’t see her so sad so we got back together,” he says with a serious face. “That was the day he grew up,” she laughs. The two share an easy camaraderie, and are secure in their own space in a fiercely competitive industry. They rubbish any talk of competition. “We’re not athletes – actors are people who express, a lot of which comes from their personalities. We have very different temperaments, and accordingly, are very different performers,” explains Das. There may not be a better artist here, but there’s certainly a star. “I have more demands. I also have more shower gels! I’m definitely the queen in the relationship,” he confesses. “And I require more space,” she concedes. When asked to present a fictional reference to their relationship, Das compares it to Eternal Sunshine of the Spotless Mind. “We’ve known each other for eight years — six while dating and two of marriage. We know how the other person reacts, how they talk, their insecurities, the advantages of the relationship, and so on. We are now only looking at how to keep this going in the best way possible,” he signs off.